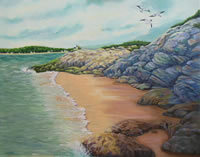 Working in a natural realism style, I depict the interplay of plants, wildlife, and landscape as affected by the unique light of the East Coast. I strive to create a microcosm within which the viewer can experience the reality of a particular place and time, and "Step Into My World." Born in 1945 in Portland, Maine, my artistic aptitude first appeared in grade school, but was not sufficiently nurtured until after I had my children in the 60’s. It was then that I began taking the occasional art class and found that I was quite adept at everything from drawing to oil painting. The exception that has never changed is watercolor! My first sales, (not until the 80’s) were private, and because of the attention those pieces received, I was encouraged to enter a few shows. Because I was working full time, it was impossible to enter more than three or four a season, but I was fortunate enough to sell most of what I painted. In the 90’s career took the upper hand. I did paint occasionally, but did not show at all. Then, in 2003, life again afforded me the time to pursue my art. I spent a year building up an inventory and began to show again. As before, I sold most of what I painted. During this time, my personal style really began to take shape. No longer was I afraid to take chances. I painted what I wanted to paint, and people liked it. From 2006 to 2010, work again interfered with my goals. 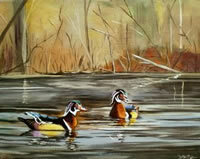 It wasn’t until I was able to retire in 2010 that I again began to paint prolifically. By the end of 2012 I will have shown at 16 juried events throughout New England. I recently moved to Brunswick, Maine, where I paint and teach out of my new studio, and continue to work on a new series entitled,“Man and Sea: Endless Struggle--Lasting Legacy."